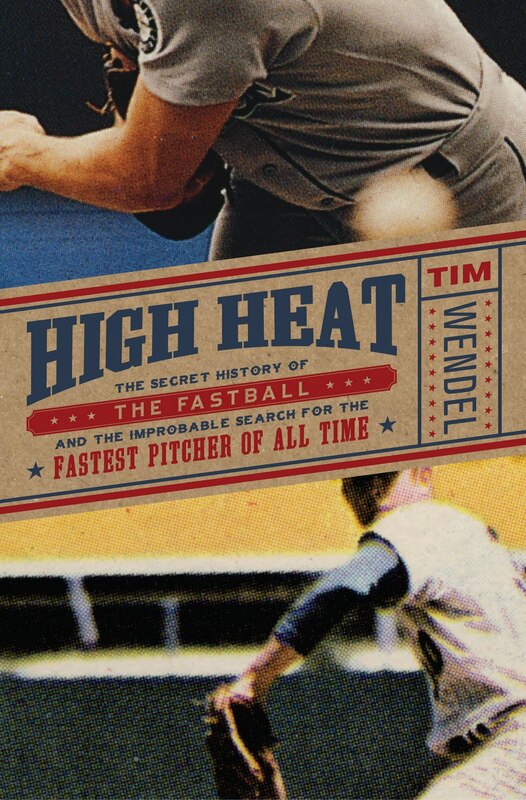 Earlier this summer I wrote about the book “High Heat: The Secret History of the Fastball and the Improbable Search for the Fastest Pitcher of All Time.” Author Tim Wendel was generous enough to do a phone interview with me about his book, but I’ve been very slow about getting that interview posted. I’ll do so over the course of the next three days. Part one of our interview examines Wendel’s motivation for writing the book, the role of stats in telling the story, and how throwing 100 miles per hour is a gift plain and simple. Also,Wendel tells the story of how Tim Lincecum wasn’t allowed in the visitor’s clubhouse in Washington because the security guard thought he was just another punk kid rather than a Cy Young winner. This is your eighth book, and I see you’ve done some other baseball books. Why write this book? This one came out in a roundabout way out of the ones that had preceded it. Actually I was in Cuba on one of my trips down there – I’ve made three trips down to Cuba and some of the other books I’ve done, Castro’s Curveball, Far From Home, are somewhat based in that part of the world. A bunch of us are behind home plate one night in Havana, both Anglos and Cubans, and all of the sudden this topic of who’s the hardest thrower ever came up and it became pretty impassioned, as do many things in Cuba, and that got me to thinking later, well if this cuts across language, culture, etc. there must be something there. And that got it kind of kicking around in my head. The book almost defies the statistical measures that are so popular today. Why write this book in such a stats conscious era? Maybe to go against the grain a little bit. You know I belong to SABR. I like stats I guess as much as most folks. But as I got deeper into writing High Heat I found I wasn’t going to find any holy grail of testing. Ironically, almost all the epic fireballers – Walter Johnson, Bob Feller, Ryan, Koufax – in their own way were very curious about how hard they threw and where they stacked up against the all-time greats, and so they allowed themselves to be tested in some very unconventional ways. We’re so driven in this era that somehow we’re going to find some stat or somehow we’re going to be able to analyze something with numbers. And what I realized once I got pretty deep into High Heat was no, that wasn’t going to be the way necessarily out of this. It was going to be more of the stories and more of almost every one of these guys ended up at the crossroads pretty early on. Were they going to make it or not? They knew they’d been given this gift of being able to throw really, really hard and were they going to be able to find their way out and do as well as everyone expected they would? Probably half the guys in High Heat did, and these are the guys you hear about that have become legends – Ryan, Feller, etc. Probably the other half didn’t, and that’s why you don’t hear that much about Amos Rusie or Steve Dalkowski and guys like that who flamed out. Once I hit that point I realized that all of us, in an odd way, you know, we’re not going to be able to throw 100 miles per hour – I know I sure can’t because I was tested and didn’t come close – but I’d like to believe all of us have some gift and so therefore maybe part of living a life is are you going to be able to bring that gift to fruition? Are you going to bring it to the forefront? In a way that’s what all these guys grappled with. One of the things that really appealed to me in doing this book was you can line up all the great fireballers, fastball pitchers, going over a century, like a police line-up, and there’s little or no correlation in height, size, weight. Maybe there’s some kind of way you can figure out fast-twitch muscles or something like that. Billy Wagner, for example, who’s shorter than me, is in this equation alongside somebody like Strasburg, alongside somebody like the Big Train Walter Johnson, and that’s really kind of cool, because I think a lot of sports we’ve kind of micromanaged this alchemy right out of it. If you want to play basketball then okay it makes sense you’ve got to be tall. If you want to play football, okay, if you really wanna go a long way you’ve got to be big and fast. One of the great times I had doing High Heat was in Washington at the Nationals ballpark with Tim Lincecum, and we’re looking to enter the visitor’s clubhouse. The guy guarding the door wouldn’t let Lincecum in, in part because Lincecum kind of like this short, skinny, punk skateboard kid. And me and another guy are like, “No, he’s actually won a Cy Young.” And because Lincecum didn’t have his ID there was a bit of a hubbub for a few minutes until they let him in. I thought that was pretty interesting, somebody like Tim Lincecum could be part of this whole equation, too. This entry was posted in Baseball Books, Uncategorized and tagged Baseball Books, High Heat, Tim Wendel. Bookmark the permalink.